Game review: Whaddya Mean By 'No Puzzles'? Whaddya Mean By 'No Puzzles'? Ohaider everyone, I haven't been writing reviews for the past few days because I went on vacation to somewhere over the rainbow. But I'm back and here to give you guys another review. :D Today, I'll be reviewing Legacy. It's a platformer that was made by jmc10. I'm expecting this game to be really good because since the platformer seems to be his specialty and I can tell you that his games are really amazing as well. Legacy is also his entry for the SGD. And since I am one of the judges for this event, I was able to play this game before creating this review. So I already know what's in it, (Sort of.) and now I'll just have to go into more detail and give my opinion on it through this review. So Legacy is a game about this demon slayer's adventure. The story is really basic, you're the hero and you save everyone from the enemies. I don't see anything too special with the storyline since it's almost like every other story out there. But I do understand that it is difficult to think of something really new. Since this game was part of the SGD it had some rules to follow. Some of the rules were that this game isn't supposed to have puzzles and it was supposed to be a full 9 level game. That really caught my attention. A game that long with just pure platforming is a real challenge to create. As I continue to play and watch the walkthrough of Legacy, (Yep, Mash the amazing has succumbed to watching walkthroughs again because she is like the best player ever.) hoping to find a puzzle or two to see if jmc failed to follow the rules given to him. There were some tiny and subtle puzzles here and there, though it's understandable since I know how difficult it is to not have a single puzzle in your game. But it's barely noticeable. 98% of the game was really just pure platforming and beating the living hell out of every enemy. I wouldn't really say that jmc followed the rule of 9 levels as well since some of the levels weren't really 'levels' in my opinion. (I hope you guys get what I mean by that lmao.) So I discovered something new today. Jmc is pretty badass, ya'll better hide yo' kids. I think the placements of Legacy were top. The placements were very constant throughout the game as well. The blocks were placed perfectly, it made the game a lot more challenging especially at the parts where you fall through a hole and you can't climb back up because the blocks surrounding you can't be used to sword climb back up. It was also fairly difficult to look for switches and things in the game, which is good. There were quite a lot of well placed obstacles that get in your way, and a lot of strong enemies were placed well too. There were a large amount of strong enemies, but jmc was able to provide enough health and extra lives for you to be able to beat them all and surpass all the obstacles that came your way too. I don't really have much complaints except that there was a little bit too much extra lives given to you and there were times where the placements became a little bit repetitive. Other than that, I loved how they were placed in such an organized manner. It didn't feel messy at all, it flowed well with the scenery too. The block placements are probably my favorite. It was really a challenge to jump from block to block without falling and getting bleeped off over and over again. The game design of Legacy was very well done, I must say. It looked pretty simple, but it was absolutely stunning. Everything was pretty detailed. The tile design choices were splendid, the designs of Legacy really fit in with the main theme of the game. Especially on the first level. Though Mr. Blockhead didn't look too happy with his plastic surgery, I think how he looks also fit in very nicely since he was well, a demon slayer. He looked pretty demon slayer to me lmao. The thumbnail of the game gave you a really bad impression of the game's design because it looked well... empty. Which was the complete opposite of the game. There was at least a block in every little nook and corner of the game. 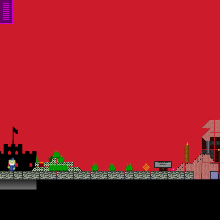 Well that's how it looked because exploration in the game was pretty limited, but I don't have any problems with that. I myself dislike games that really require you to explore. I really liked the design of Legacy, but I didn't see anything too new in the game. My only complaints here are the repetitiveness of the placements, specifically the enemy and hazard placements. Also as stated earlier, there was too much health in the game. The only thing that kind of made it original was the concept of pure platforming. Though, the game did have a few tiny puzzles along the way. It wasn't the most addicting game out there. Like I said earlier it can present a challenge, but at the same time it isn't one of those "I can't even beat the tutorial level." games.